Probably because of the little cement gravestone outside bearing his name has Yale Gracey's effects in the Haunted Mansion passed on into popular culture, to such an extent that today we even think of the fictitious family "inhabiting" the Haunted Mansion as being the Graceys, regardless of the logic or desirability of this. And Gracey's effects for the Haunted Mansion are of course excellent and famous, but they must also, let it be said, based on traditional magic tricks and optical illusions in existence since the 19th century. When you read interviews with Rolly Crump and hear about Gracey's room of effects over at WED, it starts to become clear that a lot of his work involved little "boxes" that held simple effects. As such it's somewhat unfortunate that his most famous work is the "big effects" rooms in The Haunted Mansion, because many of his best effects are also his simplest. The simple grace of his best work is as evident in Fantasyland as it is in Haunted Mansion. Pirates of the Caribbean is today prescribed "authorship" to Marc Davis, and his famous designs for that attraction have ushered the attraction on into that hazy cultural zone where we seem to be so familiar with the attraction's images from birth that a true "fresh" reaction to it is in some ways impossible, a zone also inhabited by, among others, Casablanca and Mark Twain's Adventures of Huckleberry Finn. But as famous as the attraction's pirates are, the chief remarkable accomplishment in Pirates is the effortless invocation of a whole world which is at once sprawling and phantasmal, created with the smallest gestures possible from a litany of possible images. At WED during it's golden era the smallest gestures tended to be the most confident, and that Pirates of the Caribbean still looks and feels like a massive Spanish village in the moonlight to our jaded modern eyes may be it's great accomplishment. 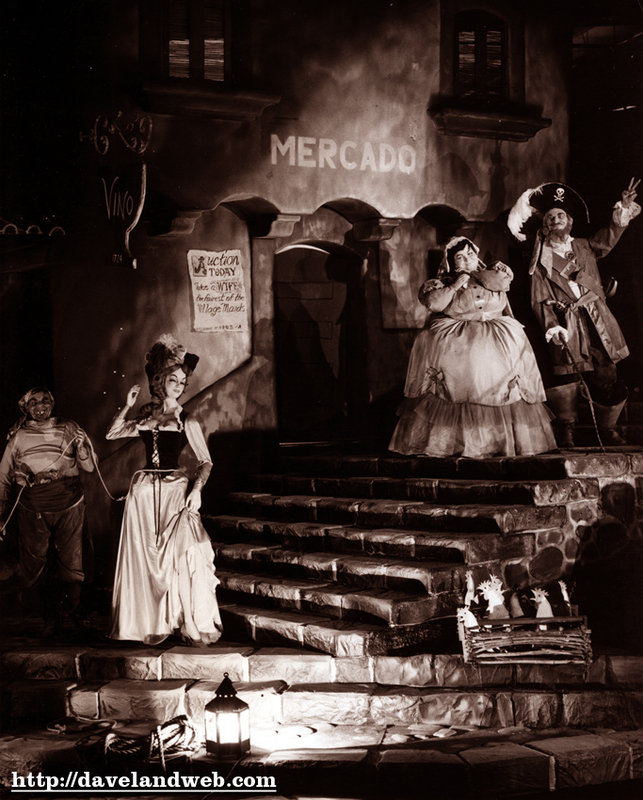 Being the first attraction to fully inhabit WED's "inside outsides" from beginning to end, in fact being the first attraction to invert the sunny Southern California day to an eternal ghost-haunted night, Pirates needed a fleet of convincing indoor-outdoor special effects. Their best Special Effect turned out to be Claude Coates, whose plans for the massive show building pushed the roof up just far enough and kept the lighting just dim enough that in all but one instance the big room housing the attraction could've gone off into the infinite. When more was needed, that's where Yale was called in. Yale Gracey's indoor outdoor effects had been baffling audiences since the 1964 World's Fair, where his moon projection had spectators convinced that they were looking at the real thing. Like all his best effects, it is simpler than it looks. His little black boxes breathe life into the faux outdoor nights of Pirates and Haunted Mansion in ways hardly seen, but felt very strongly. As the height of these effects - among his most brilliant - I think two little scenes, so contained as to be almost throwaway, are the height of what brilliant special effects can be. They are the storm raging outside the mouth of the Hurricane Lagoon show scene where the skeleton is eternally piloting his wrecked ship, and the little diorama - called Moonlight Bay - the boats pass on their way out of the load area of Walt Disney World's Pirates. The back walls of Pirates of the Caribbean are sprayed with an extremely strange texture. It's very uneven, very strong and very rough.. in short, it can be projected onto, but it's also less likely to show any one light leak in a broad area. I don't know who designed it, but it's a brilliant little textured surface which allows all those walls looming behind the little Spanish port town facades to just fall away in blackness, no matter that many of them are quite close behind the little building shells. The lights that shine on the walls to create a bit of a horizon line, like those blue lights behind the Auction, must be very strong, so effectively does this rough texture repel light. Although as I said I'm not sure if Gracey chose this texture or not, it is a key component in his effects for Pirates of the Caribbean. About halfway through the Disneyland version of Pirates, near the Old Bill figure, if a visitor were to look up she'd see clouds peacefully rolling through the sky. This subtlest of all of Pirates scene setting touches is a mild variation on on the moon effect seen in the Blue Bayou, and is in fact a basic effect box built by Gracey with uncanny straightforwardness. The effect is basically a gobo, or a die cut shape placed in front of a light to create a patterned projection. Gobos are used in the Haunted Mansion to create descending shadowy demon claws and invisible piano players, and the crisp lines resulting from a gobo projection effect would likely be inappropriate for the haze of clouds rolling through the sky. Gracey's inspired variation is a thick circular pane of glass with wavy black line painted in an erratic spiral. A light is placed near the rim of the pane of glass underneath a blue diffusion glass while the circular glass is slowly rotated. The projection is then bounced off an angled mirror and through a wide angle lens. The distortion of the edges of the lens corrects the angle of the spiral, and the "clouds" appear to gracefully float by. The blue light shines through and appears to be the "sky". These clouds are the basis for the fog which drifts lazily through the Haunted Mansion graveyard, the rising ghosts as seen from the Mansion's balcony, and - greatly sped up to mimic hurricane-force winds - the ominous storm clouds zipping by the ballroom windows and the mouth of Hurricane Lagoon. The streaks of rain which can be seen there as well are actually created with a variation of the classic classroom overhead projector. For Gracey's rain effect, a light box facing upwards has a number of erratic holes punched in its' top. Above it rapidly spins a variation on a disco ball, but actually shaped more like an American football. The streaks of light streaming out of the light box bounce off the mirrored surface and onto a tall scrim, where they appear to rapidly and erratically descend. The final effect for this economic and brilliantly realized projected weather scene is a few bolts of lightning, seen here in this lights-on picture of the Disneyland version, where the scrim at the mouth of the lagoon is clearly visible. Although lightning is projected with a gobo outside the Haunted Mansion windows, where space is compact, in Pirates an even more brilliantly simple effect is used: the back wall of the sizable projection space is made up of that uneven black surface spoken of earlier, and spray painted on the back wall with silver paint is a great bolt of lightning. A flood light flashes to illuminate the wall and since the guests see this through the diffuse scrim where many projections are already happening, the black wall is lost and only the spray painted bolt is visible. This is why we can see this effect with the lights on in this picture. Moonlight Bay captured my imagination in my youth, mostly because I couldn't quite determine what was real and what wasn't in those days before the scene was more brightly lit than it is now. 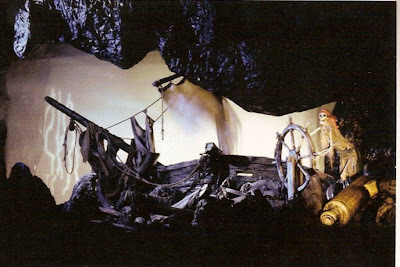 Moonlight Bay is a genuine Marc Davis original creation for the Walt Disney World version of the attraction, and is intended to preface the attack of the pirate ship on the fortress, another clear indication that the designers of the Orlando version of the attraction ditched X. Atencio's whole time travel scenario from the outset. The scene is of a ship, lanterns ablaze fore and aft, rocking gently out at sea in the distance. The back wall contains three of Gracey's cloud projection effects, the center one being a slight variation on the moon effect seen in the Blue Bayou. It's the same as the cloud effect except the blue glass the light shines through also has a pale white dot in the center of it, over which moves the painted clouds causing the much celebrated effect of clouds cutting across the moon. The Moonlight Bay clouds move very quickly compared to the Disneyland version in Blue Bayou to simulate the effect of a storm brewing out to sea. Much of the rest of the scene is a basic model; a miniature ships sits atop a slanted board on which are glued little aluminum foil waves which catch the light of the ships' lanterns but are otherwise invisible. Further down the board, nearer the spectators, irregularly cut strips of plastic cause the same effect. Nearest the spectator is the most complex variant on the Gracey cloud projection yet; but here, moonlight rolling waves are simulated. It's fairly similar to the cloud projection effects but here, a smoked glass wheel has been etched with many irregular little squiggles running from center to edge. The light bounces off the smoked glass but continues through the etchings and through a very warped glass which creates the effect of ripping water moving towards the spectator, placed in such a way that it appears to be a reflection of the moon. The effect is further augmented by the back of the circular pane of glass being painted with very even bands running from center to edge. This blocks the projection in fairly regular cycles, simulating tidal ebb and flow. What's amazing about these effects is that in reality there isn't really much there, but these scenes and effects elicit fascination practically universally. I personally spent years looking into Moonlight Bay and wondering what what model, what was projection, and so on. The clouds moving across the moon effect in the Blue Bayou is designed, and can maintain, interest for the extended duration of a meal. Marc Davis spoke often that he really wanted Gracey's changing portrait effects to have this sort of duration in a sit-down restaurant, an idea probably culled from the little glass moon. Even more startling: consider that, prior to the 2006 refurbishment, Walt Disney World's Pirates of the Caribbean didn't contain a single video image (Disneyland forfeited this in the mid 90's, of course, with ther shadow play pirate fight). Thanks to George for scanning the Hurricane Lagoon image out of the Jason Surrell book. Although as I have demonstrated previously all of EPCOT Center, including World Showcase, exhibits principles of the aesthetic mode I call Presentationalism, it is World Showcase which has resisted the business end of the account's axe much more successfully than her sister area Future World because of the Showcase's retention of aspects of Stratification - the mode of the castle parks - in a manner simultaneously traditional and unique. It is traditional in that each pavilion is essentially a self contained "land" with a consistent aesthetic at work in each, but it is unique that, being in the Presentational mode, there is no effort to blend one pavilion with the next. But an early version of World Showcase, International Street at Disneyland, would have worked this way - flowing freely from one country to the next - and the result would have likely been an incoherent muddle as obliquely "foreign" as the bulk of Adventureland. EPCOT Center's Future World did things the same way World Showcase does, letting each aesthetically unique pavilion stand all on its' own in a sea of futuristic green lawn - but those pavilions fell prey to their non-obligation to present an "objective reality" and thus would stylize themselves in any way they saw fit. As a result of this stylization the concepts behind their futuristic design templates would fall out of style and thus make them likely targets for strip-mining. The bulwark of World Showcase betrays similar design concepts but because it functions, at least on the surface, in Stratificationalist modes and because it claims to represent a specific material time or location, the trickery becomes submerged into the mire of "representation" and ceases to be visible to the spectator as being identifiably dated. The form of the EPCOT Center country pavilions essentially breaks down into two categories: courtyards and streets. On the courtyard end we have Norway, Germany, Italy, and Japan. Those pavilions which take the form of streets or passageways include China, Morocco, France, United Kingdom and Canada. The three outliers are: Africa - more of a McDonald's stand than a pavilion and thus disqualified - Mexico - which is basically a courtyard with a complex setup and payoff preshow which I have described here - and The American Adventure. American Adventure is the total outlier in World Showcase, more designed after the patterns of Future World pavilions like Horizons and Universe of Energy (ie single attraction pavilions) in both presentation and scope. It's massive bulk betrays the massive show building sitting behind it, and it is the only "monumental structure" in all of World Showcase. Its' facilities are arranged in a straight east-west row, and there is no sense of traveling through or back when the pavilion is explored which is one of the key traits of the Showcase installations. It is essentially a massive structure which hides a single attraction, and it does it sloppily. Suffice to say that WED could hardly have failed to adhere to their own rules more had they built Space Mountain at the west end of Frontierland back in 1975. One of the forms to take into consideration when forming an appraisal of the pavilions is their functionalities in hiding their infastructure. Although France and Morocco especially take the form of streets which leads back to a large building, most of the countries in this financially overrun theme park hedge their bets and those which require travel back in space are usually doing so in an effort to hide their show buildings. Indeed the Canada pavilion, essentially a courtyard in design, becomes a passage by dint of its' desire to hide its' massive circle vision theater. The chiefly brilliant design stroke in Canada is to enclose this building in a big faux rock mountain range and then force the spectator to walk her walk all the way to the back of the pavilion to enter: the mountain is the only artificial landscape feature in all of World Showcase and its' effect is singular. That you can enter through the elevated courtyard which originally held a number of gift shops or through a narrow lantern-lit gorge far below to get to the mine shaft where the travelouge film plays is another brilliant design touch, allowing a freedom of exploration essentially unknown to EPCOT Center's Presentationalist mode. It's nearly as good as any of WED's better moments in traditional theme design. Similar in layout is the China pavilion, but the burrowing back and then emerging back out where you came is inverted to the more traditional entering at the front and leaving at the back, which allows the exit, not the entrance, to be the exploration experience. 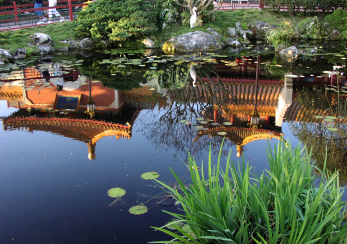 Whereas you feel as if you are going to a location to enter the Canada circlevision film, you see the China film and then work your way back out towards the lagoon. It is the difference between an experience which takes the form of a prelude or a postshow, and the attention to detail in China's Street of Good Fortune emphatically states "you've seen the beauty of China, now live it!" Even better is France's two streets taking you towards the Impressions de France theater at the very back; although it is more of a destination, the pavilion isn't hiding anything but shops between its' public spaces and as such a sense of depth and possibility - Stratification in effect - is more fully conveyed than in the Canada pavilion, where the faux landscape is pierced occasionally with a standalone structure. The "back of the pavilion destination" model is best represented by France, but Germany, Norway, Mexico, Morocco and even Japan share this trait as well. Although the attractions meant for Japan and Germany never materialized, their architecture and layout thrusts the spectator back to the intended entryways. Although it is just one function all of these pavilions hope to accomplish - hide their anchoring attractions - the sheer variety and complexity of the ways which they go about doing this is testament to the myriad variations possible on Walt Disney's "weenie". As embellishments, the water effects and locations in World Showcase aren't distinctly different than the traditional ways in which WED had been using water since the opening of Walt Disney World in 1971. The fountains, waterfalls, and whimsical embelishments are intended to give the front of each pavilion a sense of life and of prestige, tying the harnessing of water of the various cultures. The Canada pavilion has a rushing waterfall and gushing river for adventure and nature: Japan, a peaceful koi pond for beauty and harmony. France's complex entrance fount reinforces culture and sophistication while nearby Morocco's waterwheel-fed well tells of an agrarian past. But the most exciting innovation is that all of these pavilions must be passed in order to get all the way around the lagoon: the hub concept for Disneyland, there a revolutionary gesture of convenience, here becomes a solid lake where once there was only a circular moat and links all of the civilizations to the original water from which they emerged from. The hub of Disneyland which offered both inclusion and exclusion (a spectator could visit Disneyland and never once enter Tomorrowland, for example) now is a wheel uniting all cultures in location in the geometric pattern of the globe they all share, a globe which is also the master layout of the sister area Future World and the icon of the collective entity known as EPCOT which they embody. Although it may be crassly commercial in some departments, the symbolism of the World Showcase is undoubtedly touching. Of course one of the strongest challenges to the little country reproductions is appearing to actually be inhabited, which Disney responded to in 1982 by "inhabiting" them with actual foreign nationals - who act in theory as "ambassadors" for their country in EPCOT - which effectively takes care of the gift shops, eateries, and attractions. What of the rest? Thankfully, WED had extensive experience in turning rows of facades into Main Street USAs and World Showcase is one of the most extensive uses of a simple design trick I call the "false portal". A false portal can be a window, door, or any opening placed in any such way to suggest that any given themed space continues beyond where in reality it will stop immediatley out of sight. Throughout Disney parks there are false doors, false windows, false caves, false skylights, false rivers, false balconies, and practically anything which can be reasonably built to suggest that regular human activity is going on in the theme park, one of the least accommodating areas for regular human activity ever devised. The spectator isn't trained to look at the theme environment as being built for the express purpose of selling an idea to them; they look at it as they would any real life environment where things are where they are because that's where they were built, and as a result the aim of Stratification is achieved subliminally. Even the most basic Stratificationalist environments use the false portal, but the best of them use a complex pattern of false and real portals so that which is false and that which is actually present becomes intertwined. New Orleans Square and Liberty Square make extensive use of patterns of false portals, but even the more straightforward Main Street USA has little tableau and lamps and lights behind their windows to give the impression of things other than storerooms and offices back there. As such we can identify the more advanced type of false portal, more than being a phony door or window, as showing off a visible scene or prop. When these false windows are interspersed with windows or doors that lead to actual, accessible scenes and rooms, the line between actual and representational reality begins to break down completely in the mind of the spectator. World Showcase's false portals usually contain a scene or lighting rig behind them. Most all of them are lit, the only ones not lit being the dust setting inside the Mexico pavilion where the designers wish to draw attention away from the buildings which represent the "walls" of the environment and towards the focal point forced perspective scene.Those Mexico second story false portals, by the way, are very limited, essentially having two props of a vase of flowers carved to resemble a woman and a porcelain parrot in a cage. There is little definition where one structure ends and the next begins, but it hardly matters because they are more ornate than their function of being ignored dictates. Germany also, one feels, wishes to draw attention away from its' upper levels which are among the weakest to be found. Not only are the upper areas inaccessible, physically as well as visually (Italy suggests accessible second levels by running steps up to them, the only saving grace of those false portals), but the forced perspective is strange and draws attention to the illusion. The designers of the Germany pavilion are laboring to hide a massive show building and they do it with a castle (as in Norway and Japan), and they deserve credit for making the castle a discrete element of the village square rather than just pressing the "expand" button as the designers of American Adventure did and then trying to hide the ghastly size with a massive village square. Quaintness and scale are touchstones of Disney design which is what makes World Showcase more digestible to the average spectator than Future World, but this is also yet another reason why EPCOT Center was so revolutionary. Suggesting false space: France's Plume et Palette upper landing; a stairway to nowhere in Germany's Der Teddybar. The most complex and effective use of False Portals is the row of pavilions from The United Kingdom, through France and on to Morocco. Morocco creates false space in two gift shops through highly effective use of a halfscale balcony running along the back wall; although the balcony is a bit too close to the spectators to fully effectively read as full scale two lighting fixtures hang just out of sight in it. Because the roof of the balcony is accented in this way it draws attention away from the extreme short distance between the ceiling and the floor of this little balcony and the effect of there being a full size passageway up there is fully convincing. The effect is compounded by being in a narrow shop where the spectator cannot get far enough away to judge the relative size of the balcony and the major killer of false perspective is eliminated. A similar effect is used in the "Fez House" courtyard next to this little shop, where sight lines are so restricted we can only see the underside of the roof and a bit of the walls. Because there is no good way to judge the actual height of the walls from our perspective we assume they are full height and the illusion is carried out. World Showcase displays Disney's most sophisticated forced perspective in that almost always the connecting structure between foreground and background elements is totally hidden from our perspective: in order for the trick to work part of the spectator's impression of the space must vanish totally from sight, like different panes of glass in a multiplane camera. The United Kingdom gets the most credit for fully mixing real and false portals and providing visually accessible upper levels to demonstrate that this space is actually real, ie, constructed. The upper levels found in the Crest & Crown and Heraldry shops shows you an entire richly detailed upper area that is inaccessible but beautiful; walk outside and some windows have lanterns in their Elizabethan windows which create false space beyond. The upper level of the Rose & Crown, which would traditionally be an inn, has windows facing the streets with a small wallpapered wall where little framed pictures hang just beyond, creating the sense of an upper passageway. Throughout, the variations of false portals where scenes are suggested and real portals where scenes are shown give the upper areas of this little pavilion a sense of purpose and activity. France, too, suggests upper level activity through the visually accessible second level in the perfume shop and the actually accessible Bistro de Paris eatery above the popular Chefs du France. But even better are the two finest false portals in World Showcase: one is above the entrance to Impressions du France, where at night an ornate chandelier can be glimpsed through a gauzy curtain only by its' twinkling lights, creating romantic space where the hazy diffusion of a dream is achieved through the practical and logical device of a curtain. Better still is around the corner on the Petit Rue, where a large window by day becomes transparent at night with a flickering gas lamp and silhouettes static socialites can be seen in a loft apartment. Although the effect is more representational than it is convincing, it's beautifully executed - more felt than seen. The combination of these traits - layout, forced perspective, the hidden area, the false portal - support the sometimes quite beautiful travelogue attractions and films, eateries and shops, to make World Showcase a height of Disney Design in any arena. Considering that the largest public spaces of any of these little design oasises is no larger than a single block of Main Street, they are remarkably sophisticated and offer more to learn about effective theme park design than any single "land" in any of Disney's castle parks. For many years my main method of revisiting Walt Disney World was a thick tan hardcover book with a big color picture of fireworks over Cinderella Castle pasted into the center of gilt-line drawings of fleeting images from around the resort: Spaceship Earth here, Discovery Island there. Although it's badly dog eared I still have it and love it dearly, and it is perhaps a testament to my early fixations that it opens naturally and neatly to a two page full color spread on The Haunted Mansion. Those seven or eight photos are forever burned into my mind, and one of them, in particular, haunted me for many nights before my memory of what exactly was inside the old brick house was fully firmed up. 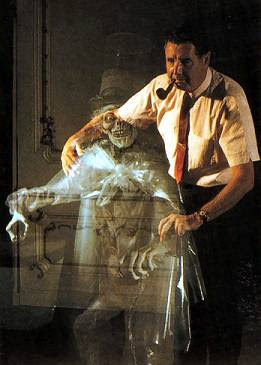 This photo is much circulated around the internet, and is featured on both Doombugies.com and Walt Dated World as pictures of the "original bride" from the Haunted Mansion. And how spooky she is! Little yellow slits for eyes and a graphical heart with the crack running down the center. Despite all of WED's and WDI's trying over the years, this may be the scariest bride of them all. The problem is that I'm not sure she was ever installed in the ride. Why? Well, first of all I may point out that there are an awful lot of things wrong with the figure, especially her hands. They're clearly just dummy rubber hands, not even actually clutching her candle or bouquet of roses. Furthermore, that's a real candle, not the light-up, "show" version WED would've used in 1969. And finally, those flowers aren't even in her hand - they're weirdly tacked to her body. But most importantly: it's just a badly made figure which WED would never have actually installed in the attraction. Thanks to Chris Merritt and Jeff at Doombuggies, we now know that these "only known photographs"of "the ghost too scary to be in the ride" are actually publicity photographs of an early, non-operable mock-up of the figure. We know that WED was building these in certain situations in this era - not only because of this famous photo of the hatbox ghost which looks quite different from the photos of the final figure, but that Daveland has posted over at his Pirates of the Caribbean blog a photo of what appears to be a full-scale mockup of the Auction Scene. We also have a set of blueprints from Haunted Portraits clearly showing a blueprint schematic of the original bride figure, complete with a wire visibly running up inside her candle to keep it lit. Moreover, this figure clearly has a face i.e. a head, which the mockup version clearly does not. The blocking of the figures and effects in the attic must have been quite difficult to gauge on paper, so it makes sense that WED would've built cheap dummies to see the scene in real space before going ahead and starting on the real thing. 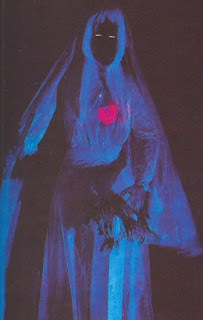 I therefore posit that the popular myth that this photo constitutes the original bride is both true and false: true in that she does represent the first ever Haunted Mansion bride ever built, but false in that this crude figure was never (and would never pass WED's show quality standards to be) installed in the actual Haunted Mansion attraction. So there's one less Haunted Mansion mystery to resolve! Walt Disney World may not overall have the same intimate atmosphere as Disneyland, but one thing WDI was able to do in 1971 at the Magic Kingdom that they weren't able to at Disneyland and which they repeated again at EPCOT Center is to include a lot of Significant Details in a lot of out of the way places. Liberty Square was the recipient of a lot of these in 1971. In many ways this sort of thinking about including a lot of culturally authentic bric-a-brac in a bid for respectability / validity is very much in line with the Animal Kingdom aesthetic, and as such the '71 Liberty Square ideas about authenticity can be said to have trickled down through WED and WDI in a very real way. Aside from the brilliance of the design of the buildings, one thing about Liberty Square supposedly true is that a lot of the slate used in the area is authentic to the Williamsburg, Virginia area and as such is slate our forefathers could've walked on. The slate brackets Liberty Square on the east and west, forming the transitory wall from the Hub and also the large wall comprising the Riverboat Landing on the Rivers of America. Who knows if it's really the same slate (even more similar slate covers the eastern facade of the Frontier Trading post a bit further down the way), but it is a Culturally Significant Detail. Another detail more felt than seen is the supposed authenticity of all the lamps in Liberty Square. If you've ever paused in Liberty Square and noticed the number of lanterns hanging in the Liberty Tree is less than thirteen, it's because of the care that needs to go into maintaining these (authentic?) relics. Outside the Hall of Presidents' main entrance stood two unique little lamp posts. Although I'm not sure if they were colonial in origin, they were original to the park and can be seen in The Grand Opening of Walt Disney World. Topped with little bronze eagles, they lent at atmosphere of distinction to the entrance of the attraction in contrast with the rest of the area's less authentic looking "gas lamps". As part of a recent initiative in Liberty Square, both of these little lamp posts and another between the Hall of Presidents and Hertitage House were replaced with brand new commercially available models. Although it's an understandable change - the one between the attraction's exit area and Hertiage House seemed to be held together with cable - it is a distinct loss of an original feature of The Magic Kingdom and, if those stories are true, of the careful design tt went into this often neglected area of the park.